Our beautiful house for rent. Even before the conversion already a fine house. But by the almost complete redesign a real highlight! 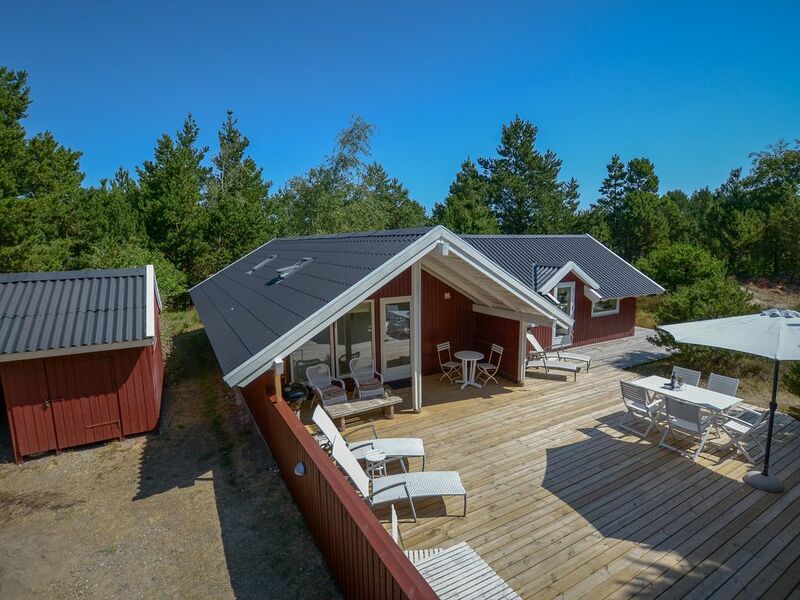 Much is new sauna hut, kitchen, extra toilet, bedroom m. Terrace and large living area! Uncomplicated and helpful wider landlord. Quiet location not far from the Wadden. More non goes we'll be back !! House of 102 kvm. The house is only 300 m on the Wadden Sea! Kromose and Østerhede are interconnected and are located on the Wadden Sea, the area where flora and fauna thrive really. In both zones, nature is very varied, it's all here, from many trees on dunes to heathland. In this area long walks are a pleasure, and in the warmer time you can bask in the smaller section with a sandy beach in the sun. Most of the houses in this area have plots with smaller lawns, usually delimited by Heide and often overlooking the Wadden Sea and / or the beautiful church of Rømø. For swimming, the Wadden Sea is not suitable, but because of the beautiful nature is worth a visit to this area always. In the southern North Sea, diagonally across from Sylt, lies our holiday island Rømø, which is connected by a 10 km long causeway to the mainland. The island is located 2.5 hours from Hamburg and attracts with unique nature and many adventure options. We have Northern Europe's widest sandy beach - 16 km long and between 1.5 and 3 kilometers wide, freedom for the soul ... Plenty of space for walking, swimming, surfing, horseback riding, play and enjoy the fresh and healthy air with high iodine content. Part of the beach is a car-free zone, a part reserved for surfers, and in the south there is a section for beach sailing and Kitebuggies. The ferry to Sylt puts every hour from, and the ferry is always an adventure, where you can admire both the birdlife of the Wadden Sea and the seal colonies between Rømø and Sylt. NB: Please bring your own bed linen and towels. The final cleaning of agency is Pflight. Wir kommen schon viele Jahre mehrmals im Jahr nach Rømø. Wir waren immer zufrieden mit unseren Ferienhäusern. Dieses allerdings wR das Tüpfelchen auf dem „i“. Total gemütlich skandinavisch eingerichtet, mit gemütlichem Bullerofen auf einem Naturgrundstück unweit des Wattenmeeres mit eigener kleiner Buddeldüne. Die Ausstattung lässt keine Wünsche offen. Alles Technische ist einfach verständlich erklärt. Von hier aus kann man wunderbar joggen oder einen Spaziergang mit dem Hund machen. Die Holzofensauna im Garten lädt zum Entspannen ein und ist besonders im Dunklen mit Kerzenschein sehr romantisch. Der Kontakt mit dem Vermieter war hervorragend und richtig nett. Wir haben uns in dem Haus wieder sehr wohl gefühlt. Es fehlt nichts, es ist sauber und gemütlich! Auch die Lage ist super - sehr ruhig und nachts richtig dunkel mit einem wunderschönen Sternenhimmel. Schnell ist man zu Fuß am Meer. Wir haben uns perfekt erholt! Dieses Haus ist ein Ort, an dem man sich zu Hause fühlen kann. Danke! Es waren wieder traumhaft erholsame Tage! Das Haus ist wunderschön, es feht nichts, es ist sauber, der Ofen wärmt, die Betten sind gut, die Küche super ausgestattet! Zu Fuß ist man schnell am Meer, das Haus liegt ruhig und nachts ist es so dunkel - ein unglaublicher Sternenhimmel! Danke für diesen Ort, an dem man sich einfach zu Hause fühlt! Wir waren schon das 2.mal in diesem Haus und wieder sehr zufrieden.Alles ist sehr sauber,und die Küche voll ausgestattet. Die Vermieter sehr nett,und wenn es Probleme gibt,wird sofort gehandelt.Wir können dieses Haus nur empfehlen!!! Here you will find Northern Europe's widest beach and a beautiful untouched nature, which is the same almost anywhere in Denmark found. Look forward to your holiday stay! Our cozy cottage has been totally renovated in 2015 and located in Kromose on the southern part of the island. The house is 92 m2 and is located on a 2500m2 with heather and pine trees overgrown plot of land in a very quiet area. Can accommodate 6 people. A large and partly covered terrace towards the south gives you the opportunity to spend many happy hours there. Bathrooms with heated floors, fireplace. WiFi: 30/30 Mb.